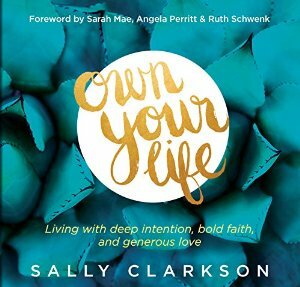 As mentioned a few years back, I have a real appreciation for Sally Clarkson's book Own Your Life - the topics covered in that particular book resonated so deeply with me - and so I was interested to see Sally is currently hosting a podcast series to go with that book. I'm about to listen to the 3rd in the series and am enjoying how the podcasts tie in seamlessly with the book. I liked the content in the audiobook so much I purchased the printed book too, which then allowed me to comb through it at a slower pace. I don't own the study guide, nor do I have any intention of purchasing it ☺ , but I am looking forward to listening along while Sally takes those interested through her book. True confession.. I have the study guide because I bought it by accident meaning to buy the book. I also have the actual book & the audio, so excited to hear about podcasts! The podcasts compliment the book perfectly .... though they could easily be used as a stand-alone source of encouragement.